Coming to the end of 2017 and what a year it was, from the surge in demand for quality sterling silver jewelry to the huge rush for natural colored gemstones. We are now in a time where, both colored gemstones and diamonds are being given equal importance. Rubies here hot, with both Burma and Mozambique rubies now being openly traded. 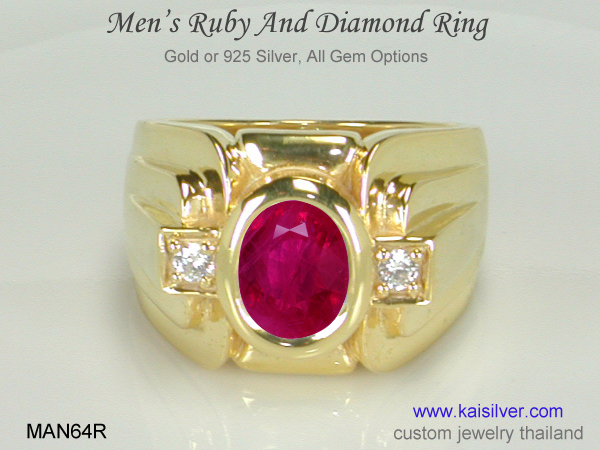 Men have turned quite fussy about what they wear, Kaisilver gauged this from the steep rise in requests for men's rubies and sapphire rings. But the fundamentals remained the same, men's rings need to be durable and tough - you can trust a man to take care of his watch but not of his jewelry. Blue sapphire is back in demand, never mind the size buyers are focusing on quality and authenticity. Keep reading this newsletter we deliver far more value than sales jargon and hype. Like always, get in touch with us at sales@kaisilver.com if you need anything related to gems and jewelry. Sapphire has always been one of the most desired and most respected gemstones in history. The demand for this blue gem has resulted in a rapid depletion of resources. 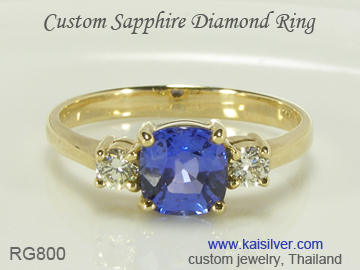 Kaisilver offers the RG800 sapphire diamond ring with a natural certified blue sapphire gemstone. If you prefer to choose sapphire but, with a different color, request for white, pink, green, yellow or orange sapphire. You could also retain the design of this gorgeous ring and choose any other gem of your choice. Available in gold and 925 silver, select from white, yellow or pink. Review the complete report ... more. Ruby is one gem that has impressed both men and women. The MAN64R from Kaisilver is designed and configured to look awesome and last for generations. The ring has a minimum metal weight of 25 grams, a secure bezel set for the ruby gemstone and high quality workmanship. Each ruby gem that we set in our jewelry, is handpicked and checked by at least 2 experts. The gemstone is then certified by an external authority. You might be interested to know that the ruby in your ring would be worth much more than the value of the gold. Get information about prices and options ... more. Shattering the myth that a good diamond ring should be exorbitantly priced. Kaisilver sources diamonds directly from licensed diamond mining houses, there are no middlemen to inflate prices. Highly skilled jewelry artisans work on each jewel, quality inspection standards are high. The RG210 has a 4mm round diamond, grade H-J/VS2, the diamond is authentic and comes with a certificate. The ring has a solid band with no metal scooping done inside, this makes the ring durable and comfortable to wear. The below 2,000 U.S$ price tag comes as a pleasant surprise ... more. Engagement Ring Budget: Once upon a time, jewelers found a lucrative way to encourage people to spend (or overspend) on their engagement ring. You kept hearing that '.... a man should spend about 2 to 3 times his monthly earnings ...' on an engagement ring for his dearest. Hollywood stepped in with its own drama '... diamonds are forever ...' and '... diamonds are a girl's best friend...'. While these worked like a charm for jewelers, the campaigns drove many young couples into debt. 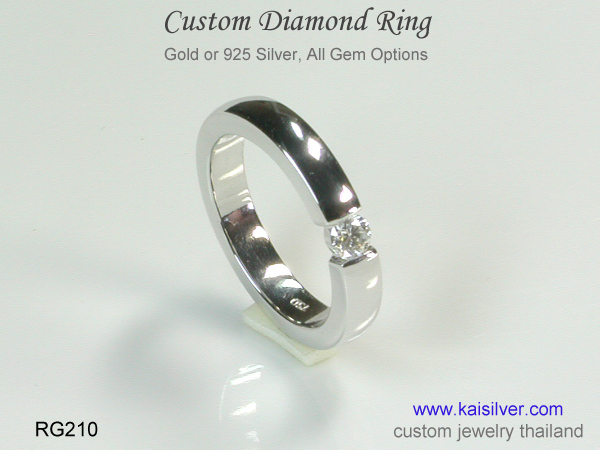 At Kaisilver, our suggestion would be to go for the best engagement ring that you can afford. If you dreamed of a diamond engagement ring, pick a modest diamond size and buy the ring from a reputed jewelry provider. The big jewelry houses with their plush showrooms might be reliable, but they are notorious for overcharging. Online is often a great way to go but, make sure that you get a genuine diamond that is certified. Go for a modest engagement ring if that is all that your budget can buy. Keep the more elaborate jewel for the arrival of your first baby or, your first wedding anniversary. Engagements and weddings can stretch your finances, you really don't want to splurge on anything. Kaisilver is surely not the only online jewelry provider but, with more than 7,000 clients across 15 nations - we are regarded as the preferred online source for custom made jewelry.